Japanese Akoya (saltwater) cultured and natural pearls are similar in that both have a nacreous coating formed around an irritant. In the case of a cultured pearl the irritant is typically a mother of pearl bead only slightly smaller than the cultured pearl. Freshwater cultured pearls are tissue-nucleated and subsequently are not as spherical as the Akoya cultured pearls. 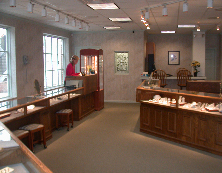 A high luster pearl will show strong and sharp light reflections. A low luster pearl will look milky or chalky and resemble a mother of pearl bead. Luster is graded on a scale of very high to very low. Fresh water pearls appear in a variety of colors. This is one of their many attraction. Salt water pearls typically appear in the colors pink, cream, white, yellow, gold, gray, blue and black. Pearls can also have an overtone color. The overtone is often rose, green, blue, or silver. Color is purely subjective. In the United States most people prefer a white or pink color. Fresh water pearls appear in a variety of shapes. Salt water pearls are valued higher the closer the pearl approaches in shape a perfectly round sphere. Terms typically used to describe shape are; round, out of round, slightly baroque and baroque. There is a direct relationship between size and price. The larger the pearl, of the same quality, the greater the value. The most popular size of salt water pearl in the U.S. is 6mm-7mm, followed closely by the 5mm-6mm, and the 7mm.-8mm. Blemishes are the surface imperfections found on pearls. Like most things created by nature they are rarely perfect. Blemishes can appear as pits, ridges, dimples, dull spots or areas of different color. The fewer blemishes the greater the value. 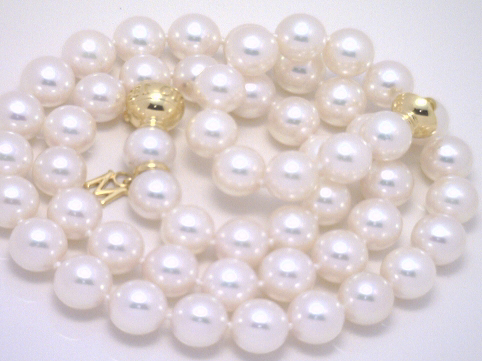 Matching refers to the degree the pearls blend with each other. Pearls in a necklace should be similar in appearance to one another in terms of size, color, shape, luster and blemishes. The degree to which the pearls match is graded on a scale from excellent to poor.